Jim Popp had barely arrived at the Argos Grey Cup rally before the tears came out. The team’s general manager was one of the first people from the organization to make his way into the middle of Nathan Phillips Square, at the foot of Toronto’s City Hall downtown. Once he saw and hugged some members of the team’s front office, the 26-year CFL GM couldn’t help himself. As Popp and other members of the team took their turns speaking on Tuesday, you could see why. 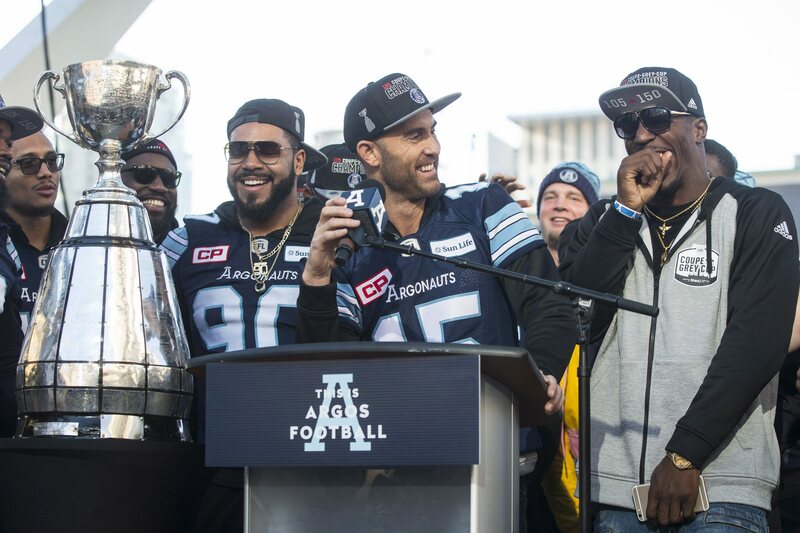 The rally was no doubt about the Argos and their incredible come-from-behind Grey Cup win over a favoured Calgary team on Sunday, but it was as much a serving of notice for everyone in Toronto and for the rest of the league about what’s been built in nine short months. “We know some of you come out to the stadium every game. Some of you once in a while. We know a lot of you follow us,” Popp said when he took the microphone in front of a crowd of fans. “If you’re not a believer, start believing. Don’t stop believing. If you’re part of us you’re a champion, that’s what I can tell you. You’re a champion today. If you haven’t joined our family, we invite you. We need you. We want you to be a part. Grey Cup or no — though the win carries a ton of weight with it — the love boat was built, as coach Marc Trestman described it, piece by piece with a bunch of people on their knees. Construction, Trestman said, started 185 days ago, with the end date of Tuesday’s rally, circled as the mark of completion. If you were walking by on Queen Street unaware of what you were hearing you might have though it was a sales pitch for anything but sports. If you envisioned, as Trestman pointed out, 185 days ago that you’d be hearing any of this, it would sound too absurd to even consider. But Jim Popp’s and Marc Trestman’s love boat is real, with an entire organization of people fully on board and the result — arguably one of the most impressive Grey Cup wins in this league’s history — speaking for itself. On Sunday, we all saw the Argos’ backbone on the field. Two days later, we saw the team’s heartbeat. Linebacker Marcus Ball explained his Today Is The Day speech, the one he gave on game day to his teammates this year that told them this was the day they conquered their adversity, whatever it may be. Today was the day they win. Trestman has long spoken of using football to teach life to his players. His thank yous included the trio of bus drives that took him, his staff and players to practice every day, from their hub of the old grounds of Don Bosco High School to Downsview Park and back. The goal is to win games and championships, but there’s always something bigger in the coach’s messages. “We tried to blend our talent into a team, because the formula was going to be this: Selflessness and talent leads to love,” he said. A perfectly pitched voice interrupted the coach, professing its love for equipment manager Danny Webb. Watching the players, coaches and execs of the team, it was clear that the buy-in on Popp and Trestman’s culture reached across the organization. For years, everyone and anyone in and around the league has had an opinion on how to fix the Argos, what they would do if they were in charge. A harmonized, championship-winning organization did what it could to reach out to the public to clear what might be the only hurdle that remains in front of it now. Mayor (and former CFL commissioner) John Tory said twice in his brief address to the crowd that hey need to buy tickets. Popp said there’s always room on the love boat. There were 24,929 fans at the East Final at BMO Field on Nov. 19. There’s momentum and a feeling around the Argos right now that hasn’t been there for a long time. It’s a good thing. You wonder if it maybe nudges Ricky Ray at all, who faces the offseason decision of riding off into the sunset as a four-time champion at 38, or coming back for more of what’s been so quickly built in Toronto. A year ago, many free agents wouldn’t consider Toronto. Some of its own free-agents fled the second the door opened. This year, things could be different. There’s a proven GM-coach tandem. There’s winning. There’s love and a love boat. Posey looked out to the crowd to conclude.